This report allows you to override the usage rates set by AWS. When you set a new rate for a service, operation, or usage type, that values is what is used to calculate a new list cost of the charge. This feature can be used to set a custom rate for CloudFront usage, or custom rates for specific instance types. These changes will only impact list cost. They will not affect the unblended or blended cost. You can create a custom rate for any service, which will automatically be reflected in real-time when the customer views their List Cost billing data, or at the end of the billing cycle when the customer receives their invoice from CloudCheckr. Enter in a description for your custom rate. This will be for internal purposes only, so you can track your work. Enter in the hourly rate for the service in question. Select which categories will be affected by the custom usage rate. For example, you might create a custom rate for A) all usage in one account, B) only EC2 usages in one account, or C) only usage by a specific Resource ID. Many businesses have custom-negotiated rates for CloudFront, so we provide you with a specific feature to configure these costs. The custom CloudFront usage rate would (like other custom hourly rates) appear in your customer's List Cost Billing data in real-time. Enter in a description for your CloudFront custom rate. This will be for internal purposes only, so you can track your work. Enter in the rate per GB for CloudFront. Select which categories will be affected by the custom usage rate. 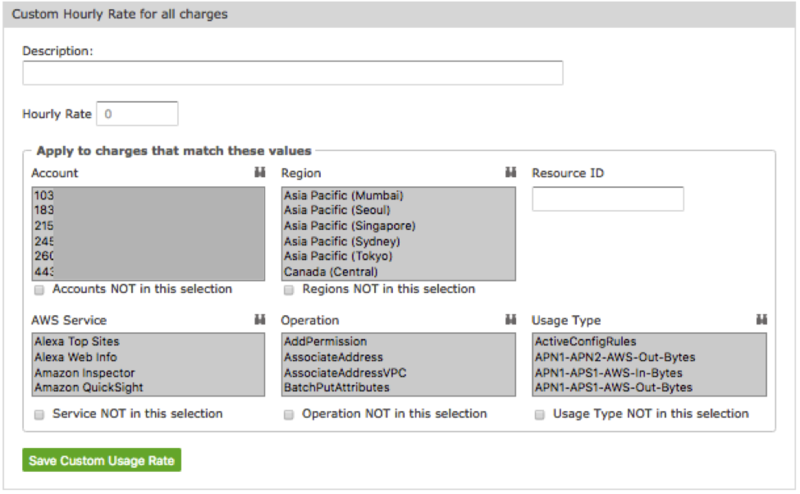 For CloudFront, you can select Account, Region, and Resource ID. In order for your changes to be reflected within already-populated data, you will need to reload your historical billing data. So, if you create a custom usage rate on February 15 but you want to modify the entire calendar year, you will need to reload the months of January and February. You can get more guidance on this on our Reload Detailed Billing Reports page. The modified usage rates will show up in CloudCheckr's List Cost. When you give your clients List Cost Only access, they will see these rates whenever they log into their CloudCheckr account, and the amounts will continually update moving forward in time. Your custom usage rates will be visible in any Cost reports that offer List Cost visibility: some examples are our Single Day and Single Month Summary, as well as our Advanced Grouping report. In addition, any List Cost Invoices generated within CloudCheckr will reflect your custom usage rates as well.